Paintball, Airsoft, Paintall Lite, Playland and more! 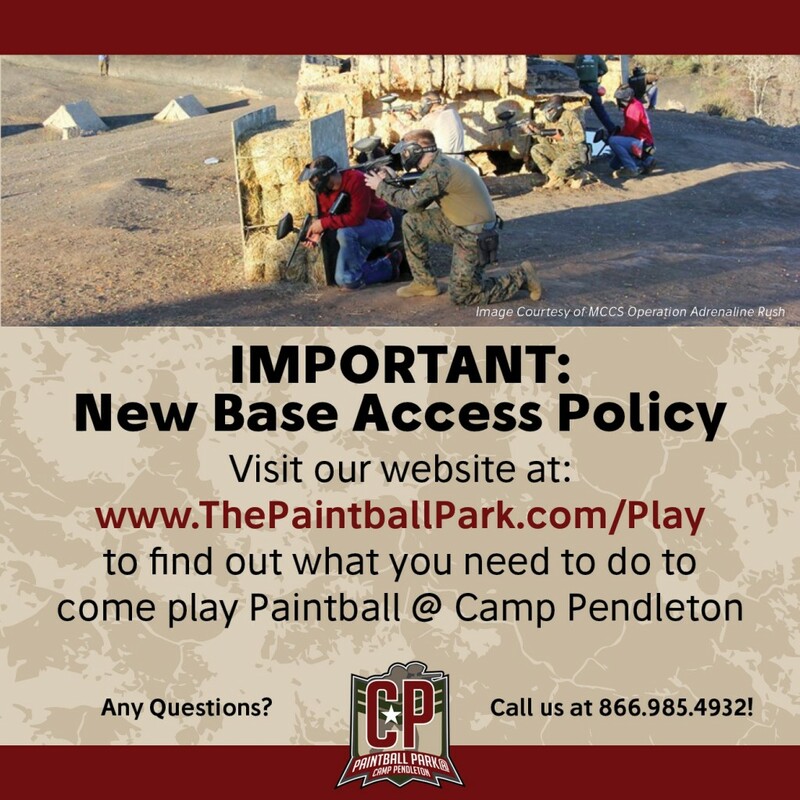 The Zombies are back and The Paintball Park at Camp Pendleton needs your help! For the fifth year in a row we are calling all Zombie Hunters and fans to The Haunted Grounds at Camp Pendleton. 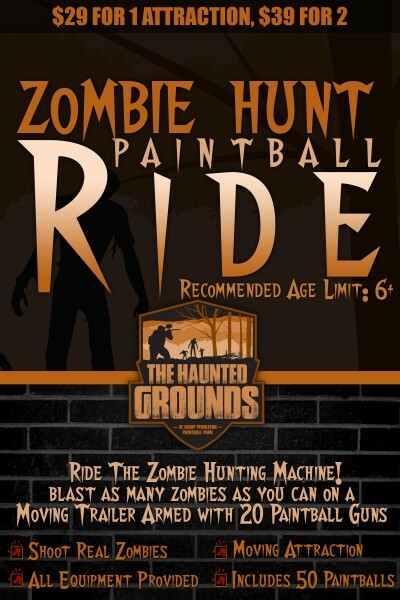 Get equipped with top of the line zombie-hunting paintball gear and walk the haunted trails shooting zombies as you try and find an escape, ride our Zombie Hunting moving trailer to eliminate from the hoard from above. 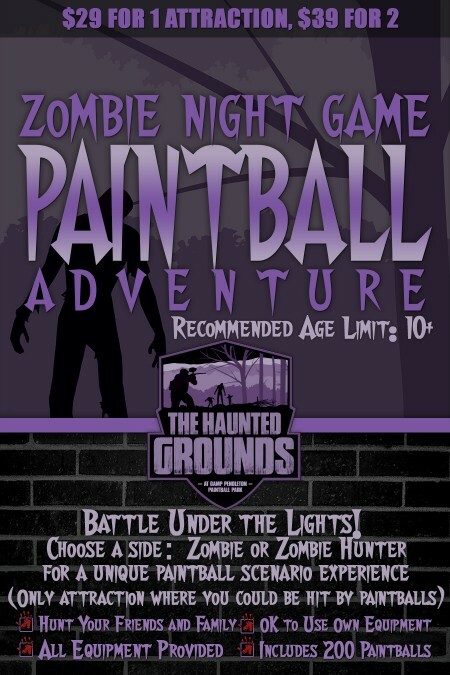 Of course, there’s the opportunity to play traditional paintball with a Zombie twist in our Paintball Adventure. Hop on our Zombie-Hunting Ride, equipped with 16 armed & ready paintball guns. Participants will enter the Ride, choose their hunting station, and our expert drivers will navigate through the dangerous Zombie fields. Actual Zombies will jump out at the ride, when you see one… let ’em have it! 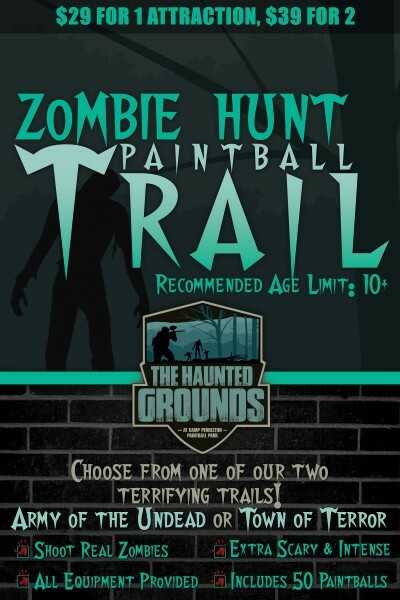 Traditional paintball walk-on play with a twist… Choose to be a zombie or zombie hunter! Grab an all-inclusive rental package with this deal and play Night Games on our most popular fields. Stay on constant alert as this is the only attraction that you can be shot by paintballs. PAINTBALL? AM I GOING TO BE SHOT AT? Absolutely not! Our Paintball activities are “You shoot at them, they don’t shoot back!” At each activity you will be given paintball gear and safety protection, but all the Zombies you encounter will not be armed. This is true for all Paintball activities with the exception of Zombie Night Game Paintball Adventure, which is traditional walk-on paintball play. DO I NEED TO FILL OUT A WAIVER? Yes, every participant has to fill out a waiver. This waiver is SEPARATE from our traditional online waiver, so please expect to fill one out regardless of if you are already in our system! CAN WE DO THE SAME ATTRACTION TWICE? Yes! You can go through each activity as many times as you like you will just need to buy a new ticket. ARE YOU OPEN IF IT RAINS? We are 100% open, rain or shine. DO I HAVE TO MAKE RESERVATIONS? No reservation required! Just show up and get ready to have some FUN! We recommend wearing old jeans, an old pair of tennis shoes, and a long sleeve shirt. We will be open from 7pm – Midnight every day during our open hours: Fridays & Saturdays in October. HOW LONG DOES EACH ATTRACTION TAKE? You can only bring your own equipment for Zombie Paintball Night Game Adventure. For all other paintball activities we will be providing you with your own .50 Cal paintball marker, goggles, etc. CAN I RENT EQUIPMENT FOR THE PAINTBALL ADVENTURES? Yes! Your package for the Zombie Night Game Paintball adventure includes our standard paintball gun, protective face mask, a compressed air tank, unlimited air tank fills, and 200 paintballs. CAN I BRING MY OWN PAINT? All paint must be purchased at the park. Take exit 54A to merge on Highway 76E. Take the 76 East, turn left on Douglas Drive. After approx. 2 miles, turn left on Vandegrift Blvd. Vandegrift Blvd will lead to the “San Luis Rey” Gate of Camp Pendleton. Enter Gate and drive approx. 1 mile. The Paintball Park will be on the left. Take exit 46 towards Oceanside, turn right to merge on to Highway 76W. Stay on the 76W, after approx. 7 miles, turn right on North River Road. After approx. 4 miles, turn right on Vandegrift Blvd. Vandegrift Blvd will lead to the “San Luis Rey” Gate of Camp Pendleton. Take exit 32 to merge on Highway 78W. Take Exit 3- College Blvd. Turn left off exit onto Vista Way, and then an immediate right on to College Blvd. Stay on College Blvd until it dead-ends on to North River Road (approx. 6 miles). Turn right onto North River Road (aka Vandegrift Blvd.). Vandegrift Blvd. will lead to the “San Luis Rey” Gate of Camp Pendleton. You must add yourself to the Visitor’s List no less than 7 days before you plan on coming. For additional information regarding requirements as well as the procedure for base access if you plan on coming sooner than 7 days please visit WWW.THEPAINTBALLPARK.COM/PLAY. Content on the website is constantly being updated and changed. Please verify all information with the office prior to making commitments or reservations. Copyright © 2008-2019 The Paintball Park All Rights Reserved.